Do you subscribe to News-2-You in your special education classroom? Have an iPad? Now you can access the weekly News 2 You Newspaper on your iPad. AssistiveWare and N2Y new free News 2 You app allows you to access your online subscription within the app or purchase news through in-app purchasing by the week or a yearly subscription. The free app provides one free newspaper to trial if you don’t have a subscription. Weekly subscriptions are available as seen below with the in-app purchase capabilities. – A variety of interactive games and puzzles for some fun while learning. 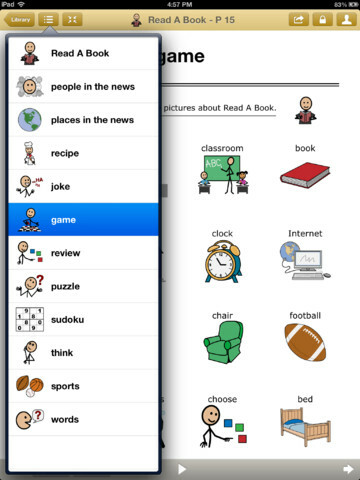 Activities can be completed within the app by typing text into crossword puzzles, completing the activities with provided symbol responses and text to speech, answering review questions by selecting picture/symbol answers provided. Reading progress and answers are tracked by user. Text to speech or audio feedback is available with the graphics and graphic supported text in the newsletter . Options are provided within the app to lock users access to a single edition or single section of the newspaper by the administrator. 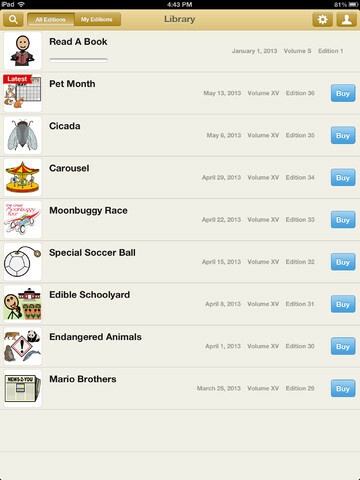 News 2 You for iPad is a well thought out app that is easy and intuitive to access using direct access. The many options provide customization to the user. Zooming out is available however it does not stay at a larger zoom level. Turning Zoom or Large Text options did not affect changes in the text size in the app. It is unknown at this time if it can be accessed with switch capabilities, however VoiceOver was able to be used within the app, which is one method of switch access on the iPad. At this time I am unsure if the app is switch accessible. Great job AssistiveWare and News 2 You! This app provides additional mobile access to literacy, leisure activities and news for special needs adults and students! If you do not use News 2 You, share with teachers and parents of individuals who might benefit from this mobile newspaper! This entry was posted in Activities of Daily Living, Activity Worksheets on Your iPad, App Reviews, Apps for Special Needs, Autism, Cognitive Impairment, Education, Emergent Literacy, Game Apps for Special Needs, Holiday and Special Events, iPad, Leisure apps, Occupational Therapy, Reading, Special education, Special Education Teacher, Special Events, Special Needs, Universal Design for Learning, Writing and tagged App Review, Autism, iPad, occupational therapy, Reading, special education, special needs students, Writing. Bookmark the permalink.